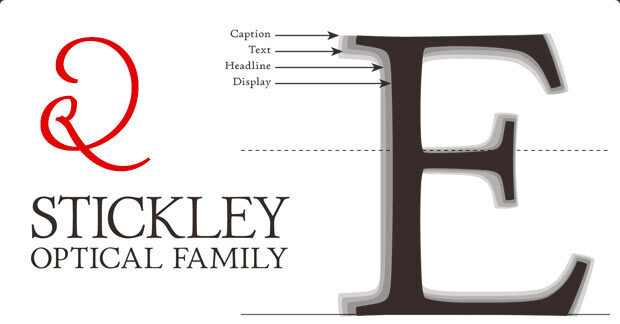 P22 is very pleased to present the Stickley Optical Family. Created by designer Michael Stickley, this exceptional font family features nuanced attention to detail at each optical size. Stickley Optical Family is an expansion of P22 Stickley Text, a humanist, Oldstyle-rooted design with a contemporary execution and full OpenType abilities. The set contains ten distinct cuts across four optical masters—in addition to Text for page content, the optical family includes Display for titling; Headline for emphasis; and Caption for footnotes and small sizes. Back in the golden era of metal type, typefaces were originally designed for the physical size at which they were to be printed, with subtle variations in proportion, detail, contrast, and visual weight to ensure they were as clear at 6 pt. as they were elegant at 68 pt. This collection of faces brings that level of attention to your digital design work. To show off the features and see the font in printed use, we have produced a booklet that shows off the flexibility and range of the Stickley Optical fonts. Welcome to P22's New website!